Finally, its here! You can now upload videos in Appsessment and share with parents and educators. This is one of the most requested features we have had and as its a big feature we have been working on this since November last year. We are happy to include this feature in Appsessment that enables all services using our App to upload and share videos which can be attached to documentation. This will help parents to see how their child plays and learns throughout the day. Using videos within documentation allows you to show the learning that is happening in the room and the development of the child. It's also a great way for you to record snapshots of experiences, events and to share teachable moments with families. 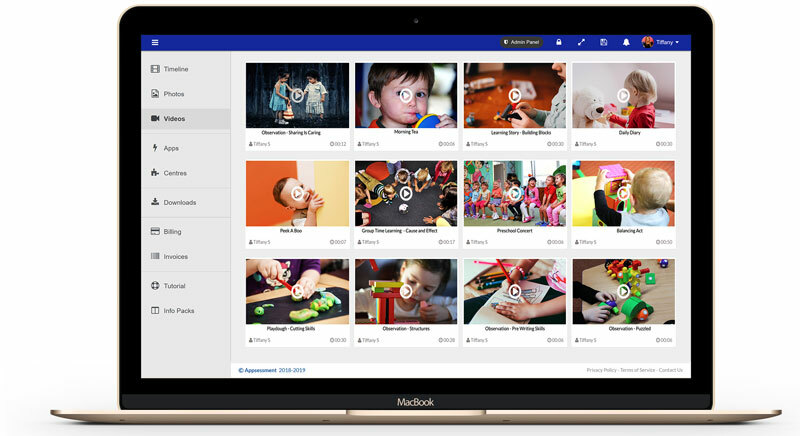 Educators can now upload Videos in their documentation and share with parents. Parents can view the update and play videos from their Timeline as well as the Videos page in their portal. A parent can also upload videos in their Parent Input forms. All videos will be automatically resized, converted to various formats during upload and uses the most compatible format when playing the video in your device. Video upload feature is available in both the Web App as well as the Mobile App. Since Appsessment supports 8 different video formats for uploading, it will make video sharing a lot easier and simpler. We hope you enjoy our latest add-on to Appsessment. If you have any issues, feel free to contact us and we will be able to help you troubleshoot it. If you are using Appsessment from your browser, refresh the browser to download the new changes. If you are using Appsessment Mobile App, remember to update your Appsessment App from the App Store or Play Store. You can safely update your App and you will not lose your App data. Thank you for your support and check out our new features today.